It’s not easy to write the second book in a series. The author doesn’t want to bore the readers with a re-hash of the characters’ lives. Yet the new reader must be made aware of the backstory. 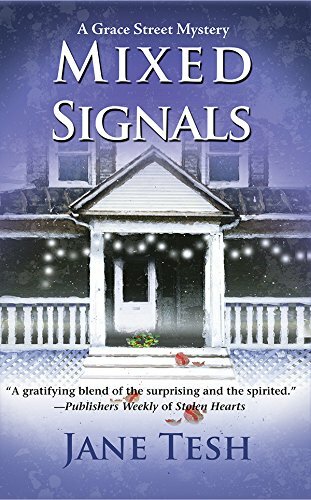 In Mixed Signals Jane Tesh has provided an interesting range of characters, but not enough backstory. It feels as if the reader has walked into a party where everyone knows everyone and you don’t know anybody. David Randall lives in a rooming house on Grace Street in Parkland, North Carolina. Other boarders include his friends Camden and Kary. David has a crush on Kary. David keeps asking her to marry him, despite his having been married twice, and not coming to grips with any of his losses. Kary is smart enough to keep refusing. There are other boarders as well, but they remain fuzzy in this book. It’s Christmas, and it’s a tough time for David as waits for a visit from his mom, Sophia, knowing she’ll want him to talk about the death of his little daughter Lindsey. His friend Camden is a psychic, a talent that’s taken in stride in this town. (Really? Where are all the fundamental Christians calling him Satan?) He keeps having bloody visions of a friend stabbed to death. David is trying to solve this murder. Camden is also unlucky in love. He sleeps better when his girlfriend Ellin stays over. But she’s a producer for a paranormal television show. She seems to want to exploit her beau to be on her show because when he is on, ratings jump, despite the fact Camden’s’ vision take a physical toll. Also there’s a person in a superhero costume running around trying to stop a series of robberies downtown. A journalist wants to catch the masked person—it would make a great story—but the secondary plot is poorly developed. Troubled protagonists are not a problem, but not having empathy for them is a problem. David is a complicated individual, and that should make him interesting, but he seems unable to cope with change: from his mother moving on, to the journalist who wants to sleep with him, and it’s not clear why. If David could get a clue, he might be worth watching grow up. Otherwise? Skip this series.